In the summer of 1906, Folksong collector Percy Grainger – the first to make live recordings of folk singers in the field using his Edison wax cylinder phonograph – captured the song The Pretty Maid Milkin’ Her Cow sung by George Leaning of Barton-on-Humber. Grainger’s highly original arrangement of that song can be heard in Footsteps Through the Snow on Thursday 5th April. 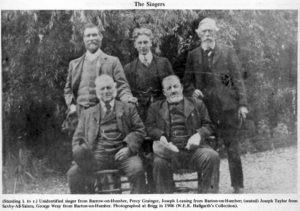 New Paths extends a warm welcome to the residents of Barton to the festival in a few weeks to hear some indigenous music and to celebrate a former inhabitant of that town who made a contribution to the history of folk song. Swedish folk music in Gunnar Idenstam’s organ recital on Sunday 8th April. 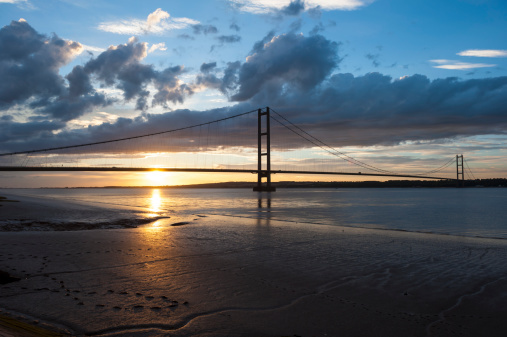 Barton-upon-Humber sits in shadows of the magnificent Humber Bridge (pictured). Opened in 1981 and at 1.4 miles long, the Humber Bridge remains the longest single-span suspension bridge in the world to cycle or walk across. It is our favourite bridge. For many festival goers the sight of the Humber Bridge en route to Beverley each spring fills them with joy as they know that they have almost reached their journey’s end and will soon be embarking on a long weekend of exhilarating music. This year why not pop into Barton or take a stroll on the glorious bridge? Grainger said: “These folk-singers were the kings and queens of song!”. Local girl turned international singer, Claire Booth, who starred in the festival last year has recorded The Pretty Maid Milkin’ Her Cow. Claire’s disc of Percy Grainger’s folk music (★★★★ The Guardian) will be available to purchase at the festival.